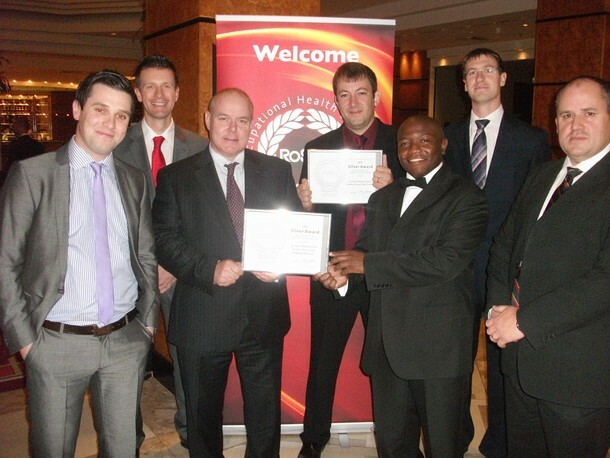 RoSPA Safety Awards success - Crossrail . For information about the Elizabeth line please visit the Transport for London website. Pictured from left to right are Declan Keane (CSJV), Shaun Hazell (CSJV), Paul Watson (Crossrail), Brett Cleavely (CSJV – Royal Oak Portal), Patrice Kpendema (CSJV), Sam Dring (Crossrail) and Wayne Forster (CSJV). Two Crossrail worksites being managed by the Costain-Skanska Joint Venture have won Silver Awards at The Royal Society for the Prevention of Accidents (RoSPA) Safety Awards in Glasgow. The annual awards recognise health and safety success and give organisations an opportunity to prove their on-going commitment to raising health and safety standards. Costain-Skanska JV won the award based on work at Pudding Mill Lane and Royal Oak portal worksites.